Mourning Doves are a medium-sized wild bird ranging from 9 to 13 inches with a wingspan of 15-18 inches. They weigh between 3 to 6 ounces. Their colors are a grayish brown back with a buff underneath, black spots on the wings, and a black spot shaped like a comma below and behind the eye. They have a small, thin black bill, dullish red legs and feet and dark brown eyes. Males are larger than females and show more color with a bluish cap, pink chest and neck feathers and three white outer tail feathers. The female is graced with an olive gray cap and a tan breast. Neck feathers can be greenish or pinkish with one or two white outer feathers. Their wings make a musical whishing noise when they fly. Mourning Doves generally eat enough to fill their crops and then fly away to digest while resting. 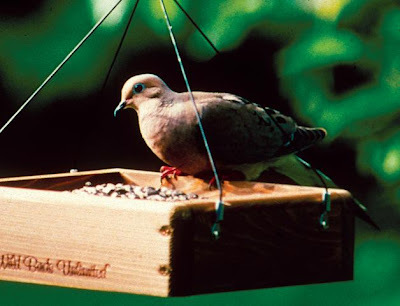 An interesting fact about the Mourning Dove is that when they are building a nest the female stays at the nest site and the male bird collects the sticks. He then stands on her back to give her the sticks and she then weaves them into their nest. A Mourning Dove pair rarely leaves its eggs unattended. The male usually incubates from midmorning until late afternoon, and the female sits the rest of the day and night. In some areas the Mourning Doves nest almost year round because they feed their young “crop milk”. Pigeons and doves produce "crop milk," which is a fluid from the lining the crop, a thin-walled, saclike chamber at the bottom of the esophagus. The parents regurgitate the "milk" directly into the hatchling's mouth and throat. Mourning Doves can be found throughout most of North America and are considered among the top ten most abundant birds in the United States. They get their name from their mournful song.